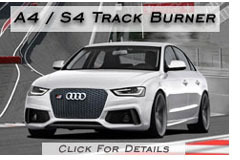 Audi S4 Index - You're on the Right Track Now! Click your model year and see what LLTeK now has available! German software for German cars. Experience a 20% increase in horsepower and 17% increase in torque. Easy to install and easy to uninstall. It will take longer to read the instructions than for you to hook it up in your driveway. German electronics and software for Audis with air suspension. Automated lowering as speed threshold is passed and automated return to standard height as speed reaches urban street speed limits. Compatible with models possessing air-assist suspension only! Make your car sharper, go faster or get some new wheels. LLTek has body kit styling and aftermarket performance tuning for the Audi S4. This is LLTeK's best entry point for S4 enthusiasts. Click on your car of choice from the tablets below and navigate styling projects as simple as lighting upgrades, grilles, or wheels --- all the way up to complete conversions. LLTeK has been importing German-made styling kits from the same group of car crazy entrepreneurs since 1996. Purchase these German products with confidence - the parts are the calibre Audi owners demand. Speak with an LLTeK rep toll-free in North America at 1 888 465 5835 and learn more about any tuning product that appeals to you.